The 1985/86 season started much in the same vain as previous seasons with Crook going through a total of 3 managers in one season and inevitable another poor season ensued. In 1986/87 Millfield saw more development with new drainage being installed and improvements to the playing surface being made. 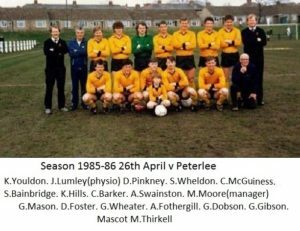 Former player David Newton had been installed as the latest incumbent of the hot seat and results saw an initial improvement however the club were still on the fringes of relegation. Crook had to win both of their last two games to stay in the division which they did at both Chester Le Street and Brandon respectively. The 1987/88 season saw more turmoil at the club with the resignation of manager David Newton during the close season. This was becoming an annual event! Former players Charlie Gott and Henry Nicholson took over in a joint capacity. Some progress was made on the field as Crook reached the semi finals of the Durham Challenge Cup but lost out in a replay at Easington. League form was pretty much the same as the previous season with the finishing near the bottom again. 1988/89 was The clubs Centenary year. However the club by now was in financial dire straights. In fact two committee members had to pay the entry fees for the FA Cup and FA Trophy out of the own pockets to avoid the embarrassment of the club not competing in either competition. 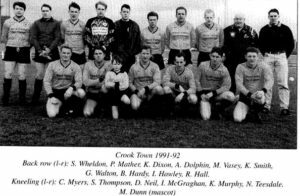 In time honoured tradition Crook again sacked their manager mid way through the season and Geoff Wade was appointed with Bobby Hull as his No 2. Results faired no better under the new management team and in what should of been a year of celebration the club tragically suffered its first ever relegation to Division 2. 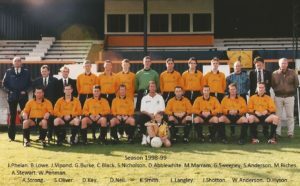 1989/90 Wade brought in a number of signings over the summer with the emphasis being on building a push for promotion straight back to the 1st Division. Indeed things started well in the FA Cup with Crook gaining a very creditable win against Northern Premier League side Workington 1-0 away. However, the early optimism was to fade quickly as results faultered and the club finished in a disappointing 6th Position in the 2nd Division. In 1990/91 Wade managed to achieve a feat not seen for a number of years from a Crook manager, He started a second season in charge! However early season talk of promotion quickly disappeared with Crook finishing in a disappointing 13th Position. Going by previous standards, due to the previous season of disappointment, surprisingly, Wade was still in the hot seat for the start of the 1991/92 season. He signed a number of players and Crook could now boast 6 players from the town in their ranks but the anticipated progress was clearly not being made and Wade was sacked in October. Former Spennymoor United player Paul Adams was installed as the new manager with Morris Flint joining as his No 2. The squad was re vamped including the signing of Colin Myers from 1st Division Brandon United and improvements were made immediately which saw Crook finish in a creditable 8th position after such a bad start to the season. One highlight of the season saw Crook renew acquaintances with old rivals Bishop Auckland who were now playing their football in the Northern Premier League when they were drawn together in the Durham Challenge Cup. Bishops were expected to make their superior league standing count and Crook were expected to lose the game heavily but somehow Crook pulled off a remarkable 1-0 win. 1992/93 saw the club part company with yet another manager after a disagreement over rewards at the clubs presentation. On the eve of the new season Crook only had 3 registered players as all the others had left over unpaid rewards. Hughie Hamilton was appointed manager and quickly began to build a squad for the coming season but after only 2 months in the job Hamilton was sacked by the board and John Fowler was appointed manager. Results did not improve and the club finished 3rd bottom in the 2nd Division. Their worst position ever. 1993/94 saw Fowler make a number of signings which included former Newcastle United striker, Alan Shoulder as player/Coach. Off the field things were looking up and renovations to the grandstand began and new floodlights were installed. Crook began the season unbeaten in 8 games which included an excellent win in the FA Cup away to Northern Premier League Workington But with only 1 win in October Fowler was rather hastily sacked and Alan Shoulder took over with the club finishing in 7th position in the league. 1994/95 saw the re opening of the grandstand. Shoulder had improved the squad and hopes were high that the club could start moving forward on the field. There was even talk of promotion! 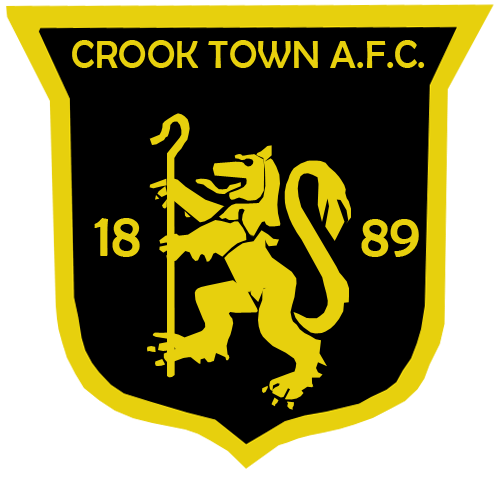 Crook indeed had their best season for some time and clinched promotion back to the 1st Division with 4 games to spare. 1995/96 saw Sir Tom Cowie installed as Club President as the club prepared for life back in the 1st Division. 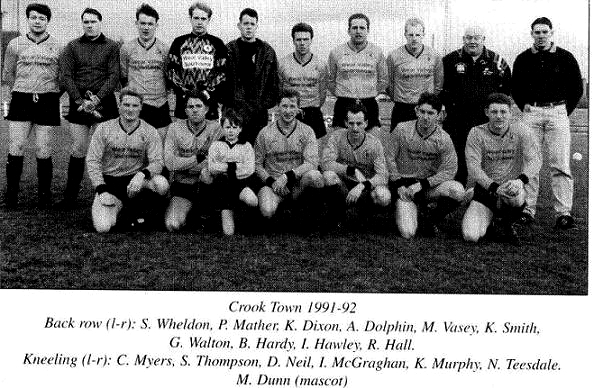 Crook held their own that season and finished a creditable mid table. 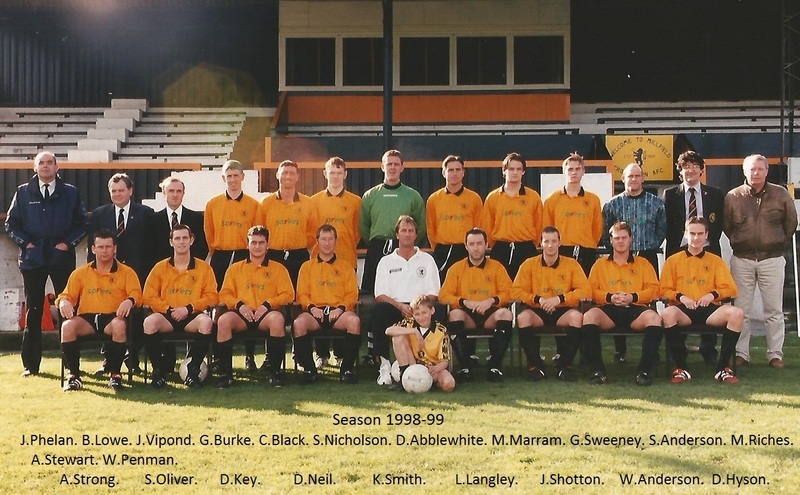 1996/97 started with very much the same squad as the previous season with only a couple of new signings. The club started well and along with a couple of additions during the season, one in the form of experienced Northern League player John Grady, the club found themselves in 3rd position going in to the last month of the season. However, with only 1 win in the last 6 six games the club finished in 6th position a massive improvement on recent seasons but as usual controversy was not far away. During the close season with expectations high for the coming season. the club were rocked by the shock resignation of manager Shoulder. 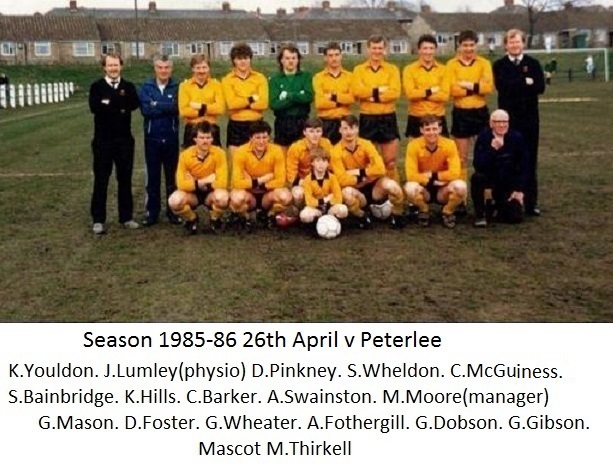 Paul Watson was installed as the new manager and his first task was to build a new squad as the majority of players from the previous season left with the resignation of Shoulder. Results were not good and with some players expressing dissatisfaction with Watsons methods, an emergency meeting was called which resulted in the inevitable sacking of Watson. Next up for the hot seat was former Darlington professional Kevan Smith with Paul Cross as his No 2. Results did improve through the season and the club moved away from the relegation zone. The 1998/99 season started with a renewed optimism but after a poor start the board once again swung in to action and sacked the manager. 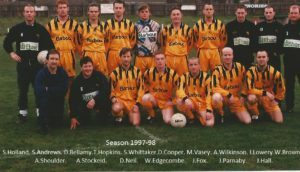 Previous manager Alan Shoulder agreed to return and a number of players who had previously played under him also returned which saw an up turn in results with Crook finishing mid table. 1999/2000 saw Shoulder set about re building the squad for the coming season. League form was in different but the cups were a different matter. The once famed cup fighters were once again making waves in the FA Cup by beating a number of Northern Premier League teams on their way to the 4th Qualifying round. They were drawn away to full time Doncaster Rovers who were now in the Conference and they proved to be too strong for Crook running out 7-1 winners in front of 2240. The cup run had proved that interest for the football club in the town was still there as gates massively increased during this run and indeed Crook took 400 supporters down to Doncaster for the game. They also managed a run in the FA Vase reaching the last 32 before going out to eventual winners Deal Town. A 700 mile round trip could only yield a 3-0 defeat. Over the summer the inevitable happened again. A major fall out occurred between Shoulder and the board and the manager promptly resigned leaving with most of the playing squad. 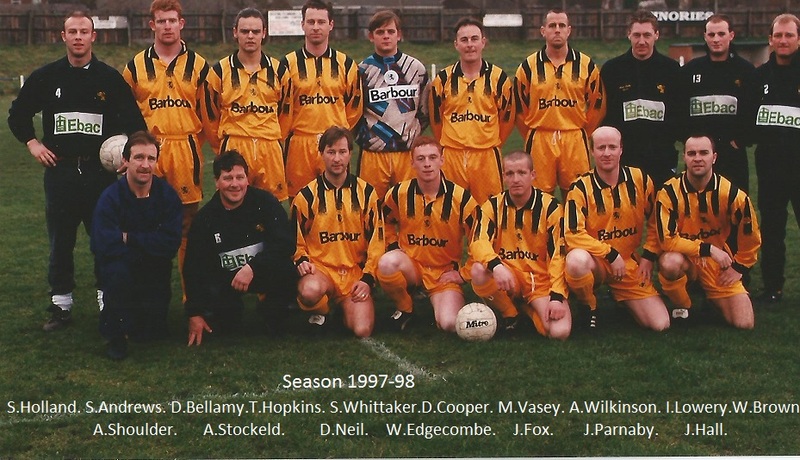 For the 2000/01 season Crook stalwart Dennis Pinkney offered his services but with virtually no squad except a number of players from Crook Towns under 18’s squad a season of survival ensued but unfortunately by the end of the season Crook were relegated back to the 2nd Division. The next 5 years saw Crook go through a number of managers and mid table mediocrity in the second division and on more than one occasions there were fears that the club would not survive.